SAN DIEGO, Calif. — Local author Jim Musgrave is featured on Sniplits’ beta test site. Anyone with a digital music player, smart phone or laptop understands the hunger for new content. 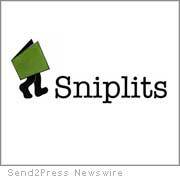 Now, with the launch of Sniplits.com, there’s a new source for entertainment on the Internet. Sniplits(SM) is publishing audio short stories, packaged as DRM-free MP3 files and playable on virtually any device capable of playing digital music. Sniplits launched its website with 85 audio shorts, ranging from about one minutes in length to nearly an hour. The stories represent the work of approximately 50 authors, including “What Were You When You Were Alive?” by Jim Musgrave (a.k.a. Efraim Z. Graves). “I wrote the story because I wanted people to recognize the plight of homeless veterans and how difficult it is to cope after experiencing combat. If just one person looks at a homeless person differently after listening to my story, then I will have succeeded,” said Musgrave. My Sniplits Author Fan Club Page: www.sniplits.com/musgrave.jsp (requires free account to log-in and view). “Our goal is to provide listeners with audio stories that are perfectly sized for any pause in their day,” says Anne Stuessy, of Stussi, Inc., creator of Sniplits. She suggests that a ten-minute story might be perfect while waiting for an oil change, while a 30-minute story might be just the thing for a dentist appointment or lunch break. Note: DRM = Digital Rights Management. Sniplits and the stylized logo are service marks of Stussi, Inc.